This book explores the resurgence of rural horror following the events of 9/11, as a number of filmmakers, inspired by the films of the 1970s, moved away from the characteristic industrial and urban settings of apocalyptic horror, to return to American heartland horror. 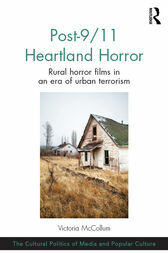 Examining the revival of rural horror in an era of city fear and urban terrorism, the author analyses the relationship of the genre with fears surrounding the Global War on Terror, exploring the films’ engagement with the political repercussions of 9/11 and the ways in which traces of traumatic events leave their mark on cultures. Arranged around the themes of dissent, patriotism, myth, anger and memorial, and with attention to both text and socio-cultural context in its interpretation of the films’ themes, Post-9/11 Heartland Horror offers a series of case studies covering a ten-year period to shed light on the manner in which the Post-9/11 Heartland Horror films scrutinize and unravel the events, aspirations, anxieties, discourses, dogmas, and socio-political conflicts of the post-9/11 era. As such, it will appeal to scholars and students of film studies, cultural studies and media studies, and those with interests in the relationship between popular culture and politics. Victoria McCollum is Lecturer in Cinematic Arts in the School of Creative Arts and Technologies at Ulster University (Northern Ireland).